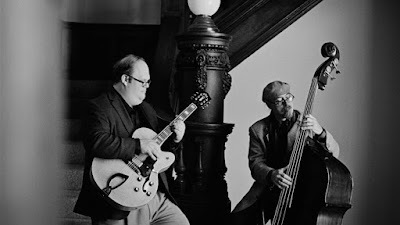 The Cincinnati-based duo of guitarist Brad Myers and double bassist Michael Sharfe recently released a new album entitled Sanguinaria (Hopefulsongs) on Colloquy Records. While also entailing the talents of other Cincinnati musicians for the project, the album features high-level interplay of guitar and bass front and center on a finely-tuned mix of originals and standards. Myers and Sharfe will bring the celebration of this new work north when they play a CD Release Show on Wednesday, April 19th, from 8 to 11pm at Brothers Drake with Columbus’ Shane Willis on drums. Admission is free to this Jazz Wednesday event. I heard the same band there in November and had a great time, so I would certainly suggest hearing the album tunes and more in living color! Keep reading for my thoughts on this excellent recording. This artful pairing of two like-minded musicians is highly recommended for all fans of inventive yet beautifully straightforward jazz. If you can’t make it to the show, the album is available for sampling and purchase here. Guitarist Brad Myers and bassist Michael Sharfe digitally released 'Sanguinaria (Hopefulsongs),' an understated and intimate recording, in late January. If you pay any attention to Cincinnati’s Jazz scene, you surely know the names Brad Myers and Michael Sharfe, two of the most active working musicians in the area. The guitarist and bassist (respectively) have incredibly impressive résumés that show that both are not in any way limited to one or two particular modes of Jazz, and both have often worked outside of the genre completely. Their bond is that they are unbounded in their creative pursuits, and when they perform together, their interplay is magical. Sharfe is Cincinnati’s go-to Jazz bassist, a founding member of the legendary Blue Wisp Big Band nearly 40 years ago who is a member of the progressive Jazz juggernaut PsychoAcoustic Orchestra. He has also worked with several regional orchestras (including the Cincinnati Pops and Symphony Orchestras) and performed alongside everyone from Rosemary Clooney and Joe Lovano to Adrian Belew and Peter Frampton. Sharfe plays with various other musicians and combos regularly around town and he currently leads several ensembles, including the Latin Jazz sextet Mambo Combo and Post Bop group Retro Nouveau. Myers first became known to local music fans in the late ’90s as a member of the popular and adventurous Jazz/Funk/Jam band Ray’s Music Exchange. He’s currently involved in numerous local projects, including Steve Schmidt’s Organ Trio, Country crew Jeremy Pinnell & the 55’s and jazzy Western Swing act The Midwestern Swing. In 2015, Myers released his first solo album, Prime Numbers, which scored praiseful write-ups from the Jazz press, including a four-star review from DownBeat magazine. 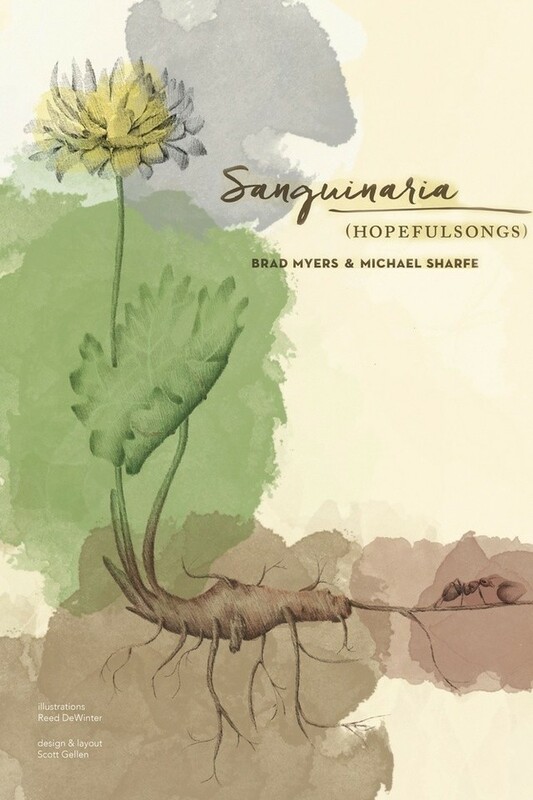 Those glowing reviews have continued with Myers and Sharfe’s collaborative album, Sanguinaria (Hopefulsongs), which was released digitally in late January. The album is an understated and intimate recording that undeniably accomplishes its stated goal of showcasing the “elements of interplay and synergy (that) are fundamental to the essence of the finest Jazz expression,” particularly in regard to Jazz guitar and bass. The album is nakedly produced and clutter free, which allows the bass and guitar to be heard with pronounced clarity. While the focus is often on how the pair plays together, there are also numerous moments where each instrument shines separately, which brings attention to the heart and soul Myers and Sharfe each put into their performances. Along with the way his bass often acts as the muscular “lead” instrument, Sharfe’s solos, especially when the bass is the only instrument in the mix, are particularly jaw-dropping. While Myers and Sharfe are both clearly technical geniuses, Sanguinaria (Hopefulsongs) is a master class in how important feel and emotion are to Jazz. In our modern age of computerized recording perfectionism, the album’s directness and raw presentation is highly refreshing and the artistry in the performances is consistently riveting. This Saturday, Sharfe and Myers (joined by Karlberg and drummer Shane Willis) will host an album release celebration at Washington Platform (1000 Elm St., Downtown) at 9 p.m. There is no cover charge, but the venue has a $10 food/drink minimum. Sanguinaria is available to purchase or stream on most digital platforms (including Apple Music and Spotify) and is available on CD at your favorite local-music-friendly record shops and through outlets like Amazon and Bandcamp. 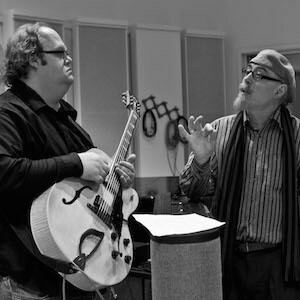 Brad Myers (on guitar) and Michael Sharfe (bass) offer the most traditional album of the three here, including songs written by the likes of Jim Hall, Keith Jarrett, and Vince Guaraldi. Myers has a classic jazz tone and like the best of the players of the genre, mixes chords and single lines effortlessly. That sort of playing highlights “Line For Lyons” and pretty much every cut on the record. He manages to mix some clever chord ideas into his solo on “Waltz New,” which features both players quoting the quintessential jazz waltz “When You Wish Upon a Star” extensively. And they both swing hard when necessary, bop when it’s called for, and as heard on “A Feeling Inspired By Maria,” are beautiful ballad players. The titular plant – also known as bloodroot – serves as symbol, metaphor, compound word, and more for the Cincinnati-based duo of guitarist Brad Myers and bassist Michael Sharfe. Sanguinaria canadensis’ carmine-colored sap is a parallel to the music-enriched blood running through the veins of these men, the plant has the ability to produce a double ower that speaks to this particular duo design, and the sanguine-aria word melding – linking optimism and melodicism – is perfectly reective of the tone of these recordings. A more apt linguistic marriage of nature’s wonders and musical expression doesn’t and couldn’t exist for this pair. This duo favors felicitous covers on this date, with eight inspired choices in the mix. The highlight list includes a cheery take on Gerry Mulligan’s “Line For Lyons,” offering a trading of foreground and background roles; a memorable trip through Paul Bollenback’s gorgeously serene, previously unrecorded “A Feeling Inspired By Maria”; a low-key, Latin-tinged arrangement of Vince Guaraldi’s “Great Pumpkin Waltz”; a solo bass feature for Sharfe on Keith Jarrett’s bucolic “Country”; and an album-capping performance of Dave Brubeck’s “In Your Own Sweet Way,” benefiting greatly from the addition of drummer Tom Buckley and the resultant tripartite symbiosis. Myers’ pen fills out the playlist, adding four originals that operate in different realms yet complement one another. The title track is a sunny and soulful concoction graced by Dan Karlsberg’s melodica and built with Baroque and Brazilian flavors, “In From Somewhere” is a swinging reflection on Johnny Green’s “Out Of Nowhere” enlivened by Dan Dorff Jr.’s dancing ride cymbal, the Pat Metheny-influenced “Norm’s Ridge” is an excitable ride that finds Sharfe moving to fretless electric bass, and “Bentley’s Blues” is a conversational twelve-bar blues born at the dawn of this partnership. Those pieces stand tall as individual statements, each makes for good company for the others, and all sit well next to the covers. Myers and Sharfe clearly know how to pick them, put them together, and play them. Brad Myers can easily claim consanguinity from the ancestry of the jazz guitar aristocracy that goes back to Charlie Christian, as can Michael Sharfe trace his musical bloodline back to beyond Ray Brown to Oscar Pettiford. If this seems like hyperbole, a first listen to their recent duo and trio recording, Sanguinaria will put the argument well beyond even reasonable doubt. Both players show great respect for the tradition but their extrapolation of well-known music from major composers such as Dave Brubeck, Jim Hall, and Keith Jarrett goes well beyond the unexpected. Both Brad Myers and Michael Sharfe are at the vanguard of a group of young musicians giving a fresh and much needed lease on life to their respective instruments by doffing their proverbial hats to the giants who set the bar at a great height. Like Olympians, they have assessed the run-up, marked their starting spots and have proceeded to clear that bar with consummate ease. Any guitarist and bassist who has played with an ensemble – or perhaps, against it – knows the feeling of a yearning for the intimacy of playing solo or in together as a duo. Both play quiet, dreamy, intimate instruments, unsuited for big stages; as poets don’t do stadium gigs. In choosing to play with each other, or with the highly skilled drum and percussion colourists here, Brad Myers and Michael Sharfe have chosen very well indeed. The depth and quality of the musicianship is sublime and both men vault over the bar taking this music with them into a rarefied realm. One has only to sample the delights of “Sanguinaria”, by Myers, and Sharfe’s arrangement of the ineffably beautiful Steve Cardenas composition, “New Moon”. It bears mention here that while Brad Myers might have contributed original music to this venture, Michael Sharfe makes his incredible musical voice heard with each significant arrangement. Consider “Line for Lyons”, New Moon”, “Waltz New”, “Country” and also “Falling Grace”. Brad Myers plays electric guitar on a few tunes on this programme, as does Michael Sharfe appear with an electric fretless bass, but the amplification is so discreet that both instruments – especially the bass – almost feel like acoustic instruments. And yet the music is wonderful whether amplified or not, because the soundworld is so big and embraces the richness of the instruments. Both men are as individual and distinctive as singers: Michael Sharfe’s intense and liquid tones, Brad Myers’ sunny, harpsichord-like precision; both duo partners drawing together and then pulling apart to solo; Brad Myers with silky tone textures, Michael Sharfe with a plump richness that embraces the music. This easy-looking music on paper is often actually fiendishly difficult to play. But these two virtuosos leap right into it. They use their instruments to unearth a huge vocabulary of sounds and effects, combinable to make them sound as big as an ensemble – but with each player’s insight to deploy effectively. The range from harmonics and pizzicato to technique exotica such as ‘nut-side’, ‘nail-sizzle’ or bi-tone tapping’, plus with a battery of percussion possibilities it would seem that each instrument comes with a drum attached. Wisely, however, Myers and Sharfe defer to experts: Dan Dorff Jr., Tom Buckley and Marc Wolfley, with Dan Karlsberg on melodica, conjuring the great Hermeto Pascoal. Cool toned guitarist Brad Myers teams up with bassist Michael Sharfe (and some cameo guests) for a cozy and intimate album. Myers subscribes to the Jim Hall spaciousness, and he swings with subtlety on relaxed pieces like the title track (with Dan Karlsberg’s exotic melodic) and the delicate “Waltz New.” Sharfe’s bass is deeply sonorous as Myers taps into his inner Pat Metheny on the evocative “Country” and Norm’s Ridge” while the percussion suavely pulses forward n “Great Pumpkin Waltz” and drives forward assertively on the bopping “In Y our Own Sweet Way.” Delightful in a plethora of ways. Brad Myers and Michael Sharfe in Sanguinaria fall back to one of my favorite periods in the then-growing jazz fusion mode: the days when John Stowell, David Friesen, Gil Evans, and other adventurous spirits were out and about, when cats like Bill Frisell were just getting their wings unfolded, when groups like the quintessential Oregon held court, and so on; a marvelous time. This duo, Myers on guitars and Sharfe on basses, brings back the age when spare pointillistic exercises in styles simultaneously classic while ahead of their time were proffered, when unusual craftsmanship was the order of the side-current day, when bold creatives cracked their knuckles, got the fires under restraint, and poured out chamber jazz that to this day has not been equalled, rarely even tried. The soundfield in Sanguinaria is spare but not austere, studied but not really academic, and clear while not glaringly bright, a bit nightclub gauzy (credit engineer Rick Andress for the merlot atmospherics). Several sessioneers quietly back the pair up in various places – when, that is, the format’s not in duet – but the focus is ever on the six and four strings tho’ the gentz themselves ply a few percussives, including…“guitar bongos” on which I’ve no clue, as it doesn’t sound like soundboard tapping). Every inch of the disc is intimately chamber ambient. I’ve quite a few times mentioned one of the coolest concerts I ever attended had Wayne Johnson (Manhattan Transfer) in his pointillistic period opening up for Towner & Abercrombie during their Five Years Later tour; Myers and Sharfe would’ve been the perfect third billing topping off the bliss a very intelligent audience felt that evening. The Sanguinaria repertoire is chiefly classics by Guaraldi (“The Great Pumpkin Waltz”! ), Brubeck, Swallow, Jarrett, etc., and four originals by Myers, who plays in the Benson / Montgomery / Green / Hall mode. Sharfe bows and plucks his stand-up with relish and vivacity, never going Jaco but always point-perfect, Ron Carter-esque, swingin’ one minute, lyrical the next, then literate, then abstract. This is a disc for a retro night in the back parlor, an evening for bringing the last of the beatniks to meet the first wave of hippies for a fond reminiscence of the way things used to be for all too short a time. "Have brain, will use; have pen, will poison." Outstanding arrangements for guitar & bass duo rooted in classic jazz and Midwestern Americana aesthetic. The new release Sanguinaria (Hopefulsongs) by well-established Cincinnati musicians Brad Myers and Michael Sharfe makes an immediate visual impression. A perfectly-rendered botanical illustration of the bloodroot plant is framed on the lower half of all six panels of the fold-out sleeve. On the cover, the subterranean root emerges into leaf and flower. Dabs of watercolor and a couple of industrious ants add detail. It is among the most striking images I have ever seen on a CD and is suggestive of a special artistic care and purpose. Mr. Myers explains in the liner notes the choice of the image as a metaphor for the duo format. “The plant sometimes produces a rare double flower… and when pierced or broken, it bleeds a reddish sap, which accounts for its Latin name.” There are multiple meanings here – that which is hidden, nourished over time, vulnerable to destruction, productive of beauty and surprise –any of which can connect to the multifarious meanings of the jazz art form. The affirmation of “roots” is ably demonstrated on two classic tunes, Line for Lyons and Waltz New by Gerry Mulligan and Jim Hall respectively. Myers unadorned hollow-body guitar sound is old-school, as is his modest rhetoric, while Michael Sharfe is authoritative on the doublebass. In stating the melody of Line for Lyons he sounds uncommonly like the late Red Mitchell. The rapport between the instruments is spot-on. The attention to harmonic nuance, gentle swing and perfectly executed chord melody treatment of this timeless theme all contribute to make this a very handsome arrangement. Waltz New, a most challenging chart, is a seminar in counterpoint and unison timing. New Moon, a modest tune by Steve Cardenas, adds a drummer. The tune asserts little but is utterly captivating with upwardly-inflected melodic phrases which seem to indicate questions. So steady is the duo in its slow walk that the drummer feels no time-keeping obligations and concentrates instead on melodic brush splashes on the cymbals. The drums stay on for Norm’s Ridge which is (as stated by Myers in the liner notes) a tribute to the Pat Metheny of Bright Size Life era. Strumming acoustic guitar supports a triplet-happy spiraling melody on electric guitar that could have been cribbed from any number of Metheny solos. If it is hopefulness that we are in need of, this Midwestern Americana vibe offers a durable source of inspiration. The extroversion of the piece is nicely balanced by tinge of sadness; the tall-grass prairie has been plowed under, and middle America has lost its way. If the album has been moving with patience of a root toward a flowering, this occurs in the seventh track, which is surely the highlight of a very fine record. On Country, a tune by Keith Jarrett, the guitar sits out and Mr. Sharfe trusts the four strings of his magnificent and very well-recorded instrument to express the pastoral implications of the melody. There is no strain or willed virtuosity, but technique is perfectly matched to communication. At 2:44 the essay is way too short; we are left astonished and bereft. Mr. Sharfe makes up for his abbreviated performance on the following Falling Grace by Steve Swallow with a very fine solo. By now we are quite sure that this bassist should be honored far beyond his native Cincinnati and hope that this CD will introduce audiences to this outstanding musician. There is more percussion than I would like on the last third of the record, but the interplay of guitar and bass remains on the highest level. Great Pumpkin Waltz by Vince Guaraldi is a rare tune and a good one. In Your Own Sweet Way is the most modern-sounding tune of the set. Myers runs the harmonic obstacle course, never losing track of the time, ably supported by a cheerful drummer and the stalwart quarter notes of the bass. Appropriately, the bass has the final solo, and it is a good one. The odd piece out on the record is the title track Sanguinaria. A peculiar melodic shape to begin with, it is made stranger by the use of what is referred to on the liner notes as the “guitar bongo.” Added to this extraneous bongoing is a melodica, which sounds like a wheezing harmonica. Perhaps this can be seen in botanical terms as a “sport” — “an unexpected production which celebrates a playful randomness in nature.” In any case, the track allows one to say that one has heard, if not seen, the fabled guitar bongo. Setting aside this title track which only fails by comparison to the high standard of the rest of the album, we can say that Sanguinaria is a superb achievement, a verified double-flowering and worthy of a large audience. Essentially a guitar/bass duo, these two jazzbos take contemporary instrumental music to places that Windham Hill and ECM haven’t explored. The apple might not have fallen far from the aforementioned trees but since these cats and their pals have an affinity for swing, daddio jazz and Latin escapades, they somehow land it all in that place where new age meets classical and jazz with a deftness Sully would admire. Tasty up market listening that throws Jim Hall into the future, this is low key set is loaded with fire that works throughout. Well done. We got to know guitarist Brad Myers from Cincinnati, Ohio through his 2015 release Prime Numbers. In March of 2017 his new album Sanguinaria (Hopefulsongs) will be released for sale. But these two works are very different from each other! Indeed this diversity can be very much credited to Brad's creative imagination as a musician and composer. Prime Numbers – a quintet inherently interweaving complex solo voices via guitar, vibraphone, tenor saxophone and rhythm section. Sanguinaria – a duo, and quite unusual: accompanying Myers is bassist Mike Sharfe. And although a number of the tracks are the realm of only the duo, the lack of other instruments, especially the drums, doesn't dilute the dialog between these two players. Both of them wield a diverse arsenal: Myers plays both electric and acoustic guitars, and Sharfe in addition to upright, plays electric fretless on one of the compositions with percussion. But this album, even with the different instrumentation, has a singular aura throughout. In modern science, we have entered into the concepts of very subtle worlds and interactions. And although these interactions are still very poorly understood, I would compare them to the dialogues between Brad and Mike on this album. With 12 pieces on the album, of course different in nature, tempo and structure, (there is a jazz waltz and also a blues) a very lyrical and deeply intimate atmosphere exists in each. In addition to four Brad Myers originals, the album includes the works of both classic and contemporary artists: Gerry Mulligan (Line for Lyons), Jim Hall (Waltz New), Keith Jarrett (Country), Steve Swallow (Falling Grace), Paul Bollenback (A Feeling Inspired by Maria), Vince Guaraldi (Great Pumpkin Waltz), Dave Brubeck (In Your Own Sweet Way). Indeed, all very different authors. However, the art of Myers and Sharfe doesn't so much unify these different styles of music, but instead forces these lines to breath through the common denominator of their shared vision. The kindest words for Mike Sharfe’s worthy solo interpretation of Keith Jarrett, in the same game, I enjoyed Myers’ take on Hall's “Waltz New” as a classic jazz guitar composition in and of itself, but has also met and confirmed my comparison of Brad with Hall from the last album, in addition to Pat Metheny and highly revered guitar guru John Scofield. What he has taken from them and brought to his own style and approach to music itself is up to the audience. But after listening to this work, I say undoubtedly.